Yesterday morning I began a small home school class for three boys ages 6 though 8 who had never been in the wood shop before. Naturally, the mothers were a bit worried about the boys' safety, and I was a bit worried about having the materials ready for the boys to work. There are some simple rules that keep the boys safe. What I learned about materials was that anything goes. What kids like best is making things from their own imaginations. My bin of wooden scraps became one boy's treasure trove as the other two practiced tool use. One boy cut a small cube of wood and turned it into a die with all the dots in their right places. Another made a space ship and landing field, while the third began work on a wooden robot. Parents and grandparents often think that they must plan something special for their children to do. Instead, what may be needed most is that they provide the tools, the place to work, some materials to work with, and that they trust the children to have ideas of their own. It can be no more difficult than that. There is no more beautiful sight in this world of ours than a little child working for love and honor's sake. But by far the most important of the spontaneous activities of the young is that of play. It is the freest active manifestation of the child's inner self, and springs from the need of that inner living consciousness to realize itself outwardly. Woodworking can be a from of play that helps children move toward the adoption of adult responsibilities. It can be done safely and children need to do it. The schools we have now are negligent of the child's creative needs and overwhelmed by unnecessary standards, so in my view, until we turn education toward a better direction, those with the capacity to create and an understanding of the value of it need to take matters into our own hands. Make, fix, create and enable others to learn likewise. Is this what schools must be like? Of course Froebel does not suppose that all that he counsels us to do... can be done in boyhood, — it may not even be accomplished in manhood, — but he thinks it should be the guiding principle and aim of every educator at all times. The end will not be reached by book-learning, listening, or passive contemplation, but only by action; for it is only by action that man learns to understand himself and others; only by studying the effects that he gains a knowledge of the cause. Gardening is one of the occupations Froebel would have us most carefully foster. By it the child gains his first glimpses of the wonders and beauties of nature; in it he watches the working of an unseen power; through it he learns to love labor, to use labor for the pleasure and good of others, and gains for himself a first touch of a sense of duty and responsibility. A child's activities should never, if possible, be left vague and purposeless. Just as the senses are to be organs of the mind, so the activities are to be expressions of the mind — of the mind of the actor, the child. In gardening, therefore, and in every other occupation, children should be encouraged and led by every possible means to make use of the results of their infant efforts, by giving pleasure and help to others. Work, which is also the fulfillment of duty, Froebel saw to be the only true basis of moral culture. In other words, if we infuse into work a sense of obligation to the community, to one's friends, or even only to one's better self, we readily make it a means of spiritual development, — a conception most important in its bearing on the healthiness and hopefulness of everyday, social life. In other words, action and the exercise of craftsmanship may lead to both skill and morality. Passivity in learning may actually lead in the other direction. Can it be that the idle hands are the devil's workshop? Yesterday in the CSS wood shop, students worked on wooden dinosaurs, finished cutting boards made with local woods, and began putting feathers on arrows. Make, fix, create, and guide others toward learning likewise. bows, arrows, archery, and culture. Woodworking is universal and its practice connects us with our contemporaries the world over. It also connects us historically to our ancestors. One of my all-time favorite novelists was a friend here in Arkansas who wrote the Architecture of the Arkansas Ozarks, a historical novel spanning generations and the settlement by Europeans of a fictional town in the Ozarks. The title of Don Harington's book was a play on the connectedness of things. The name Arkansas refers to the shape of an arc. Architecture makes the same reference and what can one say about the Ozarks? Look in the word for its hidden meaning. Don Harington was a personal friend and visited Clear Spring School to talk about culture and design, and to visit the Osage Indian structure we built like the one he described in the Architecture of the Arkansas Ozarks. If you need a reminder of how woodworking connects us to the natural world, think of the tree, Osage Orange, also called Bois d'arc. The one name refers to both the appearance of the large green fruit and the Osage Indians introduced at the beginning of Harington's tale who lived in arch shaped dwellings formed from bent saplings. The other name from French and locally pronounced Bo dark refers to the traditional use, that of making long bows for archery. One of the local names for the tree is "bow wood." When it comes to connectedness, the engagement of the hands can do that better than idle classroom exercises of mind alone. Roger mentioned a segment on NPR, an Ice Cold Case, that describes the finding of the prehistoric iceman in the alps, and the investigation that revealed his story, that of making arrows while in flight. At Clear Spring School we are making bows and arrows, which would seem unrelated to modern society. In fact, most schools would not allow children to make bows. Think of the word archery, and you may make some connections of your own. Both the shape of the long bow and the trajectory of the arrow are the same flight. The story linked above is also about making connections. 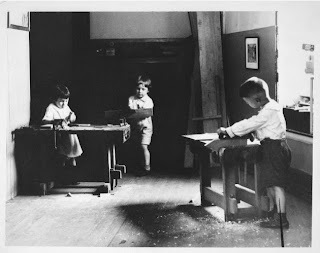 Froebel had laid out three important principles: Connectedness, Creativity, and Self-Activity. Of these, schools tend to ignore last two and the first is often lost in artificiality. In any case, today we will be attaching feathers to the arrow shafts that the students were crafting when Roger visited Clear Spring School two weeks ago. Make, fix, create, shape the world in your own hands, and enable others to learn likewise. Last week as the head of Clear Spring School and I met with folks from an association that promotes charter schools in Arkansas, I pointed out to their pedagogical expert that what we do at Clear Spring School is in perfect alignment with the stated goals of the charter school movement. She then cautiously reminded us that there are unstated non-pedagogical goals that are in direct conflict with what the stated goals are, and those involve standardized testing and the idea that charter schools are intended to offer quality education on the cheap. The very nature of that conflict destroys the concept. You can teach cheap as some charter schools do through the use of rote memorization using any number of devices that can be installed as technology or hammered home by teachers in a rigid educational structure. But is that really what we want for our kids? She asked me if other crafts could be used in place of wood shop, and the answer is yes, but there is no better way of engaging kids in creativity for pedagogical purposes than through woodworking. Here are some of the features of woodworking that give it particular value that not all crafts share to the same extent. In considering the use of other crafts and technologies, I offer the following points for comparison, and each of these points could become the basis of a blog post. These are not the same as those points compared by Salomon in the chart below. 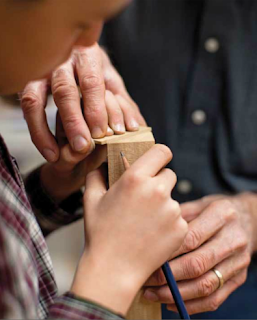 Woodworking connects students directly through tactile engagement to the natural world, opening direct pathways to the study of nature and community. Woodworking can be used as an educational resource for children of all ages, allowing them to build skills as they develop progressively toward greater physical strength and mental capacity. Woodworking and woodworking projects can be closely correlated to study in other disciplines, for example, math, literature, history, music, and science. Woodworking allows children to take projects from basic raw materials to a finished, useful form. Art on the other hand may be purposely correlated to studies in various disciplines, but its results are most often merely decorative rather than useful. Woodworking projects can be useful in the home and serve in the community, thus building relationships between the school and the rest of the child’s world. Woodworking projects allow students to gain a sense of their own capacities to contribute to the well being of family and community. The products and by-products of woodworking are bio-degradable and present no significant or lasting challenge to the environment. The materials for woodworking are obtained at little cost and available in the local community. Wood can often be harvested and used in such a manner that materials are kept from landfills or from entering the waste stream. By-products from woodworking can be safely composted for use in gardening. The tools for woodworking can last many years in an educational environment. In comparison, computer based technology create a continuing dependency on an ever-changing technological landscape. And the tools themselves present a burden in disposal. Schools face a huge financial burden in regular acquisition of new technologies in order to contend with rapid obsolescence. Working with wood, due to its nature, offers resistance, requires attention, particularly in the use of hand tools, thus developing in the student, the powers of attention and observation. Woodworking can be satisfying to ALL students. Skills (both technical and conceptual) learned in woodworking can be transferred and applied to other crafts and to other career opportunities. Objects can be crafted from wood that enhance studies in other disciplines. Laboratory tools are but one example. There are no limits to what can be made from wood and there are no limits to what can be learned from woodworking. Woodworking projects can be designed to move from the known to the unknown, from the simple to complex, from the easy to more difficult and from the concrete to the abstract, thus applying the basic principles of progressive education. Woodworking can (as will many other crafts) develop the student’s moral character and creative intelligence. Woodworking can be most easily be adapted to pedagogical purposes. Woodworking has a long history of pedagogical use that new teachers can utilize as a foundation for further development. Most communities have woodworking enthusiasts who can be tapped as possible resources for developing new programs. Woodworking satisfies the students' needs for creative self-activity. More generally, crafts of all kinds were the primary cause for the advancement of material science. You cannot whittle a stick without having formed hypotheses, and without making observations. I think it is perfectly safe to state that of all crafts and technologies that can be applied in school, the pedagogical value of woodworking is high and the overall cost low. I've not presented this as a final document, but to stimulate thought. Please share your own insight using the comments below. Make, fix, create, and urge others to learn likewise. Yesterday the CSS building club and I made a new compost bin for the garden at Clear Spring School. We were amazed at how the whole thing was completed so quickly. We can attribute that to four things. One, we followed a successful plan working toward the completion of a concrete object. Two, we worked with good materials. Three, the students and I worked well together. And four, the students had access to the right tools for the job. What they didn't know, they learned. “In schools we create artificial learning environments for our children that they know to be contrived and undeserving of their full attention and engagement… Without the opportunity to learn through the hands, the world remains abstract, and distant, and the passions for learning will not be engaged.” –this blog as quoted in Shop Class as Soulcraft. One of Educational Sloyd's principles was that of moving from the concrete to the abstract. The mistake educators have made is that of abandoning concrete work in schools to enter a realm of endless abstraction. The relationship between the concrete and abstract is more like a dance than a vector. Students never outgrow the need to be concretely engaged in learning. When we forget concrete learning, we drive children into abstraction. Some leave schools as trouble youth. Getting an idea across to kids is more effective if I have a concrete model of what I want them to make. Their own creativity is spurred by examples of things they can make. Learning music is more effective if you hold an instrument. Learning botany is more effective if you hold a leaf and hug a tree. Learning chemistry is more effective if you work in a lab. Learning history is more efficient and effective in the long run if students actually visit historic sites. Yesterday the Pope stood at ground zero in New York City and asked the world to pray or him. But we put children at desks as though that will answer to the needs we all share of their growth into mature human beings. Perhaps we should pray also for ourselves that we might come to a clearer understanding of the roles we must all play in the education of new generations. The idea of education is too much that of managing children in a cost effective manner, rather than that of mentoring them toward our collective success. Freidrich Froebel had offered this motto. "Come let us live with our children." This blog is intended to suggest the way we may best do that. Some have noted that I write in the blog every day. You need not read every day. In fact, it might be better if all of my readers were to simply take what is written here in one day and take it to heart and put it to use in transforming American education at all levels, pre-K through university post-graduate degrees. The message is simple, so I repeat myself. We learn best and to greatest lasting effect when we are engaged hands-on. There are a lot of people working in a similar direction. We have maker spaces happening is some schools and libraries. We have PBL (project based learning) happening is some schools. In the meantime, there seems to be a missing link in that few fully grasp the hands' potential in educational transformation even though we all know that we ourselves have learned best and at deepest levels when our hands have been engaged in doing real things. When we have accepted the role of the hands in educational effectiveness, we begin to understand why wood shop is important, why maker spaces are a must, and why children would be best served by learning chemistry, science, math, music and even history and literature hands-on. Learning is the most natural of human functions and yet through schooling, we make students resistant to it. They sit bored in classrooms: the countdown? over 16,000 hours before graduation. But if kids are allowed to get out from behind desks and to do real things, schools would be re-energized, students would retain learning longer and we would alleviate the depression that often accompanies being stuck in something over which we have no control. Even teachers would have fun in school if the hands were set free under an imperative that schools engage in the exercise of craftsmanship. Today in the Clear Spring School wood shop I'll meet with the student building club. The school needs a new composting bin to build soil for the school garden and that would be a good beginning project, as it involves cutting wood, and assembling it into a useful structure. Make, fix, create, and make certain that others learn likewise. self-activity and the impact of real learning. To create becomes an addictive process but one that needs not be detrimental to our communities. It makes a difference what we make. You might get an idea in mind to create something that threatens others, or you may carve a spoon and feed soup. Nevertheless, it was Froebel's idea (though he was not the first to express it) that what a child learned needed to be balanced by the expression of that learning through what a child did with it. Hence, making was to be as much a part of schooling as books and lectures. The reason I say that making and creating can become an addictive process is that the feedback we receive by observing our own hands in the creative process fulfill what Abraham Maslow called "self-actualization." As we create, even at the smallest scale, we observe our own skill, our own power and own potential for growth. And so in that manner, making and the urge to make anchors itself at the very heart of life-long learning. When I was visiting on Monday in Little Rock, a woman from the organization of charter schools asked, "The Wisdom of the Hands idea might also be expressed in fields other than woodworking, right?" And of course that it true. But it is best conveyed by those with real passion for the creative process, and a true understanding of the ways skill builds both character and intelligence in kids. Can a painter, or a potter or or blacksmith or skilled technician in robotics perform the same function in schooling? The answer is yes, but, there's more. 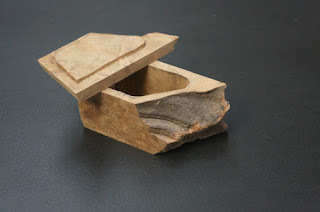 There are aspects in the very nature of woodworking, related in part to the fundamental inter-connectedness of it and to what Ivan Illich called "tools of conviviality," that make it particularly well suited to educational purposes. In the days of Educational Sloyd, Otto Salomon spelled out the differences between woodworking and other crafts in his effort to explain why woodworking sloyd was best. I need to do the same thing now, but add to it the various ways that woodworking better connects with a child's interests and the interests of society at a deeper level. In any case, self-activity is a relatively simple concept, but one that must not be ignored for more than a minute regardless of grade level. Yesterday my first, second and third grade students began making t-rex dinosaur models from wood. 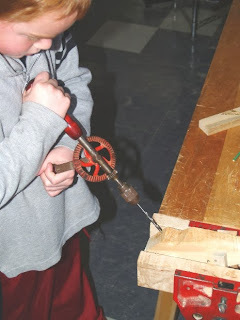 It is a project that takes a lot of sawing, and so the kids began noticing sawdust on the bench and on the floor, and decided that the pile of sawdust that came from their cuts belonged to them, and that it could be used as "pixey dust". With my students becoming distracted by imaginative play, the project may take a day longer than planned. But they also began sweeping and cleaning the shop, as the collecting of sawdust became an important mission for each child. It is interesting to adults to see my students clean shop. The process is rewarding to them because the broom sweeps up enough volume of shavings and dust to give the child a sense of accomplishment. The children can be very possessive about their sawdust, and yesterday was not the first time I've heard my students claim, "This is my pile of sawdust." Would they make similar claims about their standardized test scores? It has been a very quiet week so far on the Clear Spring School campus, as most of our students have been at ESSA, taking classes in painting, pottery and jewelry making. I've begun trying to affix feathers to arrows that I might stay one small step ahead of my upper level students as they will be doing the same thing next week. Make, fix, create, and insist that others be given the opportunity to learn likewise. the history of education in teacher prep. Knowing the history of education may not make you able to teach, but Scholars Lament Decline of Ed. History Courses in Teacher Prep and I agree with them. 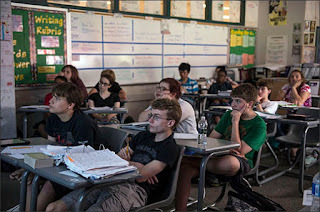 Once an ubiquitous course requirement that nearly all aspiring teachers took, the history of education seems to be going the way of land-line phones, floppy disks, and shorthand. Crowded out by an ever-expanding teacher-preparation curriculum in the latter half of the 20th century, such courses are now almost exclusively electives reserved for graduate education students, according to scholars who have documented the decline. Those who would Walmartize education, and turn teachers into checkout clerks, would want teachers to know nothing about the long and innovative history of education or the contributions of Pestalozzi, Comenius, John Locke, John Dewey or Uno Cygnaeus, for knowing the history of education would call current methodology into question for those teachers who saw the broader view. For example, what if all graduates of prestigious Teacher's College in NYC knew that their own institution was established in the first place to prepare teachers in the practical arts? Would they then have an understanding that the hands must never be forgotten or ignored in schooling? Yesterday I went to Little Rock with with the head of Clear Spring School to investigate becoming a public charter school. But as we met and as we explained our objectives and the character of our school, and learned what would be demanded of us, we learned that the costs of becoming a public charter school would be a greater burden than we could bear. The charter school movement in general is not about taking schools back to what worked, but relentlessly toward what will never offer the merit to students that Clear Spring School provides. Education must start with the interests of the child, not with the interests of adults achieving certain test scores within a student body. In the meantime, one of the best ways to know if a kitchen knife is sharp may not be to scalp the hair from your arm , or to "feel" its edge, but to simply sight down its edge as you rock it slightly from side to side. If you see a consistent shiny spot, as shown above, it's where the edge is worn flat. After more careful sharpening, the shiny spot will completely disappear and no light will be reflected back toward your eyes but rather to both sides. 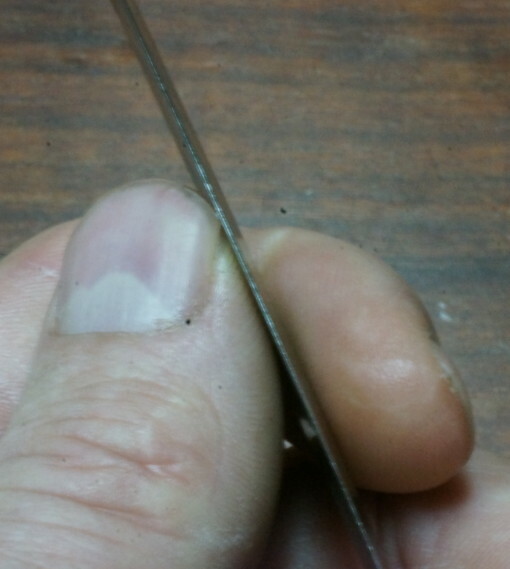 A truly sharp knife will cut light.This same approach works on other edge tools, too. For instance, I can look at the edge of a plane and know immediately whether it needs attention. Today with the first, second and third grade students, I'll make t-rex dinosaurs. In my wood shop, I'm making lovely small boxes. ....most people have it in them to become good craftsmen. They have the capacities to become better at, and more involved in, what they do - the abilities to localise, question and open up problems that can result, eventually, in good work. Even if society does not reward people who have made this effort as much as it should, in the end, they can achieve a sense of self-worth - which is reward enough. But is that sense of self-worth enough to fulfill the needs of a society at large? Is it healthy when people are inclined to seek outside their own communities for the things that they most desire? And what is the real price we pay when both truth and the values inherent in craftsmanship are set aside? Irving, Texas made the news last week when school officials and police arrested and handcuffed a Muslim boy who brought a home-made clock to school. School officials claim they suspected him of making a bomb, and while he made no threat with it, and insisted it was a clock, anyone with any level of practical experience in the world would have seen the truth of what it was, a clock. They did none of the things that schools would normally do if threatened by a bomb. They simply made a fraudulent arrest in what appeared to be an effort to humiliate a young man who may have seemed different from the rest. Irving, Texas appears to be a place in which the truth is distorted for profits large and small. Exxon Mobil is also headquartered in Irving, Texas, and they also made the news this week. In the 1970's their researchers were the first to discover and warn of the inevitability of climate change resulting from the use of their product. They then spent millions to distort the facts as is well documented in a new report on what they knew, when they knew it and how they then decided to screw the planet to insure their own corporate gains. What does this have to do with the hands? It has clearly to do with values, lack of values and those willing to put corporate profits over the health and safety of the planet and its inhabitants. Matti Bergström gave a name to those whose values have been damaged by failure to engage the world in a hands-on creative manner. He called the people suffering such effects, "Finger blind." The consequence of finger blindness is damage to the system of values that have served as the foundation of human culture since before the darkest ages of pre-history. Bergström said, "just as those who are physically blind cannot see the outlines of an object, the finger-blind cannot perceive its intrinsic value." Being thus "values damaged" narrows the scope of values guiding behavior to a single concern. Money, money, money and more of it. It explains why directors of Exxon Mobil would destroy the planet, know that they were doing so, and then do everything they possibly could to sustain their profits without regard for the rest of mankind or the for the planet. If you are not disgusted, you should be. the undisclosed value of manual arts training. ...how can a just society, in which all are treated fairly and able to find and generate work satisfying both to themselves and to the needs of society, educate the full range of tradespeople necessary to vital communities? 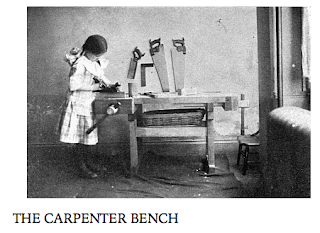 the child must not only practise intuition, and express the representation which he has thus received, but should also learn to carry out in play, and in smaller pieces of hand-work, what he has grasped — should as a productive being be educated from the beginning to self-activity and productive energy — should thus be educated through work for work. ... In this way I was led to the thought that we must introduce into the school not only Froebel's gifts and the rest of the exercises in work recommended by him, but also establish for elder children such kinds of hand-work as have for their aim the training of the hand, the development of the sense of form, and of the aesthetic feeling, and which help young men to a general practical dexterity, which shall be useful in every walk of life. ...But all these kinds of work must not be conducted like trades, but always with reference to the aim of general education and as a means of culture." I restate Salomon to apply additional emphasis on an important point. “...persons not manually trained, generally regard the products of manual labor and performers of that labor of at less than their real value." In other words, those who fail to understand the real value of manual labor, what it entails, and what it cost to learn, and to learn well, will not grant dignity or fair value to those who perform it. It's why we have a 99% and a 1% who could care less for the bottom tier of society and who place themselves on pedestals of wealth as being better than the rest of us. It's also why we import so much junk from other countries instead of developing an ethos of craftsmanship in our own citizenry. This was a point that brought some contention between Otto Salmon and his mentor, Uno Cygnaeus when Salomon made statements in favor of separate manual training schools. Cygnaeus insisted that Salomon had misunderstood the important societal principles involved. Students were not to be divided and sent along on separate career and educational tracks without having first acquired a thorough understanding of the dignity of all labor. Make, fix, create, and insist that all be given an equal opportunity to learn likewise. This article from Forbes spells things out pretty well. Why We Desperately Need to Bring Back Vocational Training in Schools. The history was thus: In the 50's high schools began sorting students into vocational and college tracks. Why waste history, Latin and physics and higher math on someone who would rise no higher than an auto mechanic. And why waste technical learning on someone who would go to college and rise above the need to ever lift a finger? Minorities and the poor soon realized that the vocational track was being used as a way to wrongfully sustain an offensive class structure. So the decision was later made that all students would be pushed onto an academic track, and shop programs were allowed to die a thousand deaths, as shop teachers retired, or were pushed aside. In the meantime, shop programs had become a dumping ground for those students who for various reasons could not or would not compete in academic subjects, and the number of high school dropouts soared, as students found themselves stuck in classes that were painfully boring and of no direct interest in their own lives. What had been forgotten were the ideas that had been promoted by Educational Sloyd: that both character and intellect, as well as a heightened level of personal engagement came through the crafting of useful beauty. So they killed shop programs all across the US and we've become burdened by an incredible waste of educational resources. In my shop I've continued to edit the text for chapters in my tiny boxes book, and am at work on writing the text for the last projects. In the meantime, there is a growing recognition that college should be free, and that those who are burdened by debt from the attendance of college should have that burden lifted. Would it not be even better that all vocational training and continuing education be made free? It's the side of education that we have now neglected for more than a generation. Make, fix, create, and help others to learn likewise. Friedrich Froebel had laid out the basic conditions of development, for he was not concerned with test scores but with the development of humanity, one child at a time. The second was self-activity. The student must be actively rather than passively engaged in learning so that he or she would utilize what was taken in expressed in a self-directed, self-motivated manner. The third was creativeness. Creativeness is the means through which the student makes personal claim to the object or expression achieved through learning. Self-activity of mind is the first law of this instruction; therefore the kind of instruction given here does not make the young mind a strong-box into which, as early as possible, all kinds of coins of the most different values and coinage, such as are now current in the world, are stuffed; but slowly, continuously, gradually, and always inwardly, that is, according to a connection founded on the nature of the human mind, the instruction steadily goes on without any tricks . . . from the simple to the complex, from the concrete to the abstract, so well adapted to the child and his needs that he goes as readily to his learning as to his play; indeed, I was a witness of how the little ones, whose lesson had been somewhat delayed by my arrival, came in tears to the principal of the institute and asked 'whether to-day they were always to play and never to learn, and whether the big boys only were to have lessons?'" Make, fix, create, and establish for others the opportunity to do likewise. Shown in the photo at left are my first, second and third grade students with their first finished project for the year. One asked, "will we get to do anything else?" Of course they will. The idea is that schooling should address the whole child, both in the absorption of learning, but also the testing of that learning through the outward expression of it. In simple terms we can call it, "Learn to Make." No thing can be done without either care or lack of it being expressed. And the practice of craftsmanship hones the spirit and sharpens the mind. Making objects of useful beauty from wood fulfills Froebel's principle of "creativeness," and should be one of the objectives of schooling. In my upper elementary school class, my students had a sanding competition to see who could sand their cutting boards to the highest level of "smooth." When it comes to the exercise of craftsmanship in the creation of useful beauty, we all win, in that the character of the child is made whole. Is that so hard for educational policy makers to grasp? This morning and afternoon I had two classes of middle and high school students making arrows. Cyrano explained that he had to leave school early. Could he spend his recess in the wood shop instead of in the play yard? He did not want to fall even a moment behind in his craftsmanship. So as I was preparing for my elementary school class, I was joined first by Cyrano, and then by Ozric, each quietly doing his own work. In the meantime, I'm a bit at my wit's end trying to figure out how to get educational policy makers to understand the role that the hands can play in transformation of both the individual and in schooling at large. Is that my job or yours? Those folks are too busy thinking that computers and technology will solve all the world's problems. The Organization for Economic Co-Operation and Development (OECD) the international organization responsible for PISA testing, has done a study showing the utter failure of digital technology to deliver what it promised . Technology has thus far failed to deliver what educational experts have expected of their huge investment in it. Roughly speaking, the nations doing best in the education of their kids are the ones with the smallest investment in technology, and increases in the use of digital technology in school are not warranted. My thanks to David for sending the link: Computers 'do not improve' pupil results, says OECD. Readers might be interested in thinking further on the subject. Tool users have long been dependent on the use of cognition implanted in the tools and devices we have made or purchased that enable us to work. OECD would naturally be measuring the intelligence of students without device in hand. Naturally holding the entire Cloud of worldwide information in your hands would make you seem intelligent and feel smart without really being so. The field of study on this is called "distributed cognition, or collective intelligence." But are schools to be making kids smart, or simply providing a means through which they might appear so? And if we admit that the purpose of technology is to make difficult things easy for us, but that the development of self is dependent on doing and mastering difficult things, should we be flooding schools with new technologies, or instead developing the whole child through craftsmanship? I know the answer, but no one else seems to be asking the question. Make, fix, create, and assist others in learning to do likewise. I've begun taking a few sample beauty shots for the Tiny boxes book. This photo or one like it will also serve in the Marc Adams School of Woodworking 2016 catalog which will come out in November. 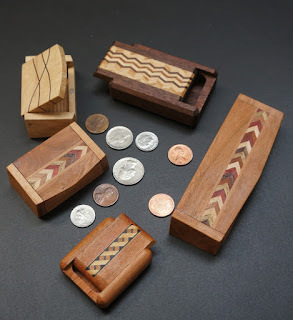 A class on "pocket boxes" will be one of two weekend classes I'll teach this summer at Marc Adams School. I'll also teach my usual week-long box making class but only once this summer. ...since education has largely to do with inducing the right acquirement of knowledge and the right use of knowledge, the task of the educator must largely consist in bringing out and making clear, and maintaining the connectedness of facts and things. But connectedness was not only to be seen in externally organized facts, but also in the integration of the child into the learning environment. This was accomplished through self-activity and creativeness. Yesterday in the wood shop we had visitors, Roger and Donn who were traveling through from Louisiana to Minnesota. My students were so deeply engaged in their work, that if one had been curious about what Froebel's term self-activity meant, it would be clear. My students worked confidently, and cleaned up on cue. So you can imagine why I might be proud of them and their work. I was concerned however that my students were too busy at their work, and not as observant as I hoped they might be of the effects of their work. ...the young should gradually and continuously come to feel and to see that laws underlie all organic formation, and that conformity with those laws is the fundamental, unvarying condition of all true every-sided development towards perfection––in other things first, and then in themselves; while gardening and the care of animals should, in addition to this also make labor a pleasure and a duty. So again, when using art as an instrument of his system, he does not undertake to form artists, but seeks to awaken the ideal side of human nature, and to produce in the young a feeling and a perception that in all beauty there is a perfection of the thing after its own kind––another experience of the law and harmony. Make, fix, create, and encourage others to teach likewise. I had a full day in the Clear Spring School woodshop, with one class of 4th, 5th and 6th grade students making cutting boards from the same species of woods that they had identified as favorite trees. The 7th grade students and 9th through 11th grade students began working on arrows, and the first, second and third grade students made desk accessories. All students were glad to be in the wood shop, for hands down, it is a favorite class at the Clear Spring School. My teaching colleague Tony asked me whether or not we are all (in our culture) suffering from a lack of sufficient memory. I don't know. Let me look it up on my iPad. OK? Our digital assistants are making memory of facts and concepts an unreasonable burden, when we can save brain cells and just look up what we want to know on our iPhones.Why memorize a poem or carry concepts around in our brains when we have google to rely on? All things are being made easy by technology so we can appear smart within our own delusions of self. ... to the young child, as to primitive humanity, all knowledge does, as a matter of fact, come as one whole, and that the subdivision into subjects and departments is a very gradually evolved plan, for the most part wholly artificial, and only adopted for the sake of convenience. Moreover, the very nature of knowledge itself teaches the necessity of connectedness. Facts in isolation, and unrelated to one another, do not form knowledge. Facts have to be compared, classified, organized, connected before they become what we call knowledge. ...Education should be one connected whole, and should advance with an orderly and continuous growth–– as orderly, continuous, and natural as the growth of a plant." One could argue that these days interconectivity (a pseudo connectedness) is provided by google and facebook, delivered through each and every digital device. But what happens when true Frobelian connectedness is no longer present in the heart and mind of each child? Are we each to become dependent on the digital device to feel connected?I asked my students what would happen if a massive sunspot were to take out every digital device on the planet. (Scientists say that this could happen.) "We'd go crazy, one said." But people who have something to do and a way to do it are less likely than most to suffer derangement. I suggest a visit to the CSS woodshop. Here you will find students fully engaged, heart, body and mind. I have wood working classes all day at the Clear Spring School, and no time to write. But yesterday my fellow teacher Tony had the letters ZPD on his white board. I asked what the letters meant. "Zone of Proximal Development" Tony replied. Tools provide a means through which we create and connect. Carlyle had noted that without tools man was nothing. Much of this is discussed by Lev Vygotsky who also came up with the term "Zone of Proximal Development" or ZPD. But the question arises, how much do we work to develop man and how much do we work to develop the tools of man. Which tools develop integration between intellect and physicality, and which tools diminish individual human capacity? ZPD is an intellectual concept/tool that Tony hopes will help his students to reflect on why they are in school and what they are to do while in school. "Then came Froebel, who urged that the child must not only practise intuition, and express the representation which he has thus received, but should also learn to carry out in play, and in smaller pieces of handwork, what he has grasped––should as a productive being be educated from the beginning to self-activity and productive energy––should thus be educated through work for work... In this way I was led to the thought that we must introduce into the school not only Froebel's gifts and the rest of the exercises in work recommended by him, but also establish for elder children such kinds of hand-work as have for their aim the training of the hand, the development of the sense of form and of the aesthetic feeling, and which shall be useful in every walk of life... But all these kinds of work must not be conducted like trades, but always with reference to the aim of general education and as a means of culture." The idea that schooling is about what's put into the child's mind should be pushed aside to make room for the notion that what comes from the heart, mind and hands of each child serves as the foundation of human culture. Sverresborg Trøndelag Folkemuseum in Trondheim, Norway. Make, fix, create and propose that all children be led to do likewise. I ran across the term "educational realism" in a book about Froebel, used in association with Comenius and Samuel Hartlib. For certainly, what we teach kids should be based on their observations of reality, and the best use of a teacher's intellect is not to stand before a class of bored students, demonstrating his self-inflated egotism, and command of "facts', but to launch students into a process of investigation from which they learn for themselves. And what better way can there be to observe the nature of material reality than by shaping it through the use of common tools in woodshop? The following is from H. Courthope Bowen's book, Froebel and Education through Self-Activity, 1897. 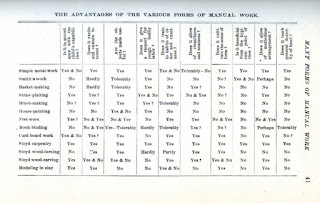 The term "manual training" is not a very happy one; for though the hand is the chief instrument we employ, and though the aim is partly to make hand-work aid the pupil in his acquisition and assimilation of knowledge, we nevertheless endeavor to train much more than the hand. 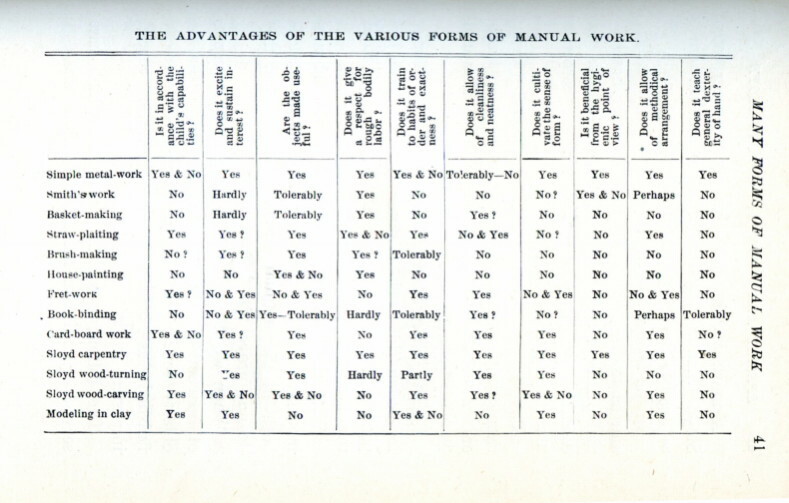 The term should be taken to mean training through the use of the hand, or exercise in expressing the mind by means of the concrete; and the New Jersey Council of Education summed up the matter excellently when (in 1889) it stated that "Manual training is training in thought-expression by other means than gesture and verbal language, in such a carefully graded course of study as shall also provide adequate training for the judgment and the executive faculty." Stated in this way, it will be seen that manual training is a direct outcome of the kindergarten exercises, and is in fact the necessary intermediate stage between those exercises and technical instruction; though it need not advance as far as that instruction. As a further development of part of the kindergarten activity and creativeness, it has its place as a necessary part of general education, and should be treated as such; otherwise it has no right to be in the school at all. If technical instruction is to follow — not unless — a gradual movement in the direction of specialization may be made in the later school stages; but this should not proceed to the extent of isolating the manual exercises. The nature of the change is easy enough to see. The aim of the school, besides the production of knowledge and of skill in the use of knowledge, should be the production of the power to think. We produce the power to think by thinking; and one of the chief means which we employ for this is the expressing of thought. 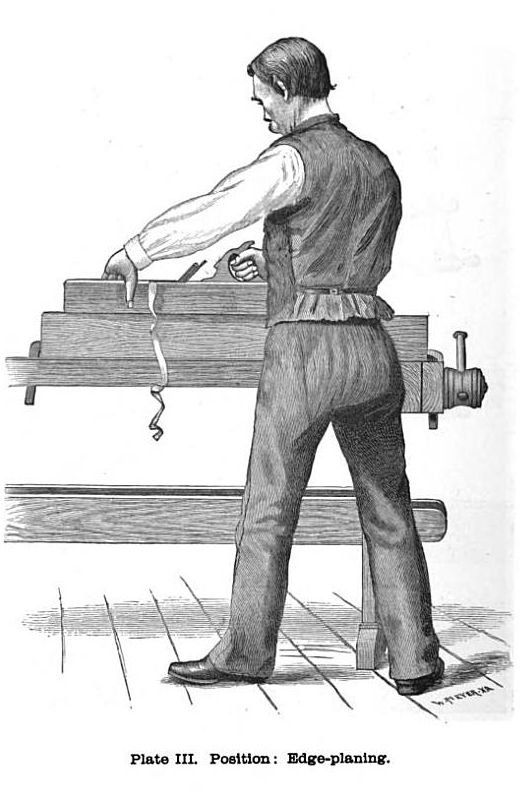 Manual training will begin in this way, as hand-work for the sake of head-work, which will gradually tend to become head-work for the sake of handwork — in other words, knowledge will be more and more brought in and applied for the sake of skilled results, and accuracy will be more and more insisted upon; while all through we shall carefully abstain from trying to force into the manual work what the thought itself, of which it is the expression, does not possess. For instance, we shall not begin with a pedantic and tiresome insistence on accuracy (which is not a characteristic of the young mind), but endeavor steadily to lead up to it—to grow it—producing at the same time an ever-increasing appreciation of its value. "Pragmatism is derived from the teaching of Charles Sanders Peirce (1839-1914), who believed that thought must produce action, rather than linger in the mind and lead to indecisiveness. John Dewey (1859-1952) applied pragmatist philosophy in his progressive approaches. He believed that learners must adapt to each other and to their environment. 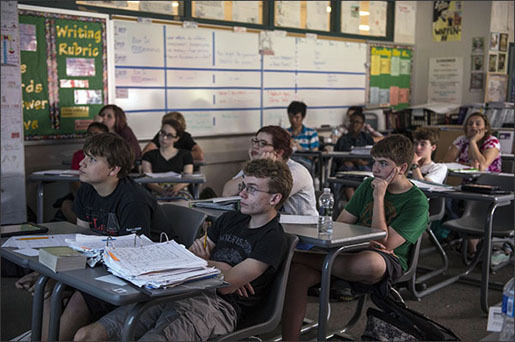 Schools should emphasize the subject matter of social experience. All learning is dependent on the context of place, time, and circumstance. Different cultural and ethnic groups learn to work cooperatively and contribute to a democratic society. The ultimate purpose is the creation of a new social order. Character development is based on making group decisions in light of consequences. For Pragmatists, teaching methods focus on hands-on problem solving, experimenting, and projects, often having students work in groups. Curriculum should bring the disciplines together to focus on solving problems in an interdisciplinary way. Rather than passing down organized bodies of knowledge to new learners, Pragmatists believe that learners should apply their knowledge to real situations through experimental inquiry. This prepares students for citizenship, daily living, and future careers." Make, fix, create, and empower others to do likewise. *In his monograph: “How Lina learns to write and read” (and not to read and write), Fröbel fixes in a precise manner the age which is suited to learning to read; he puts this occupation in the last year of the kindergarten. He supposes that Lina has attained the age of six years, and that having observed the joy of her father at receiving a letter, and his eagerness to answer it, she has conceived the most intense desire to learn to write. But it must not be lost sight of that the little girl had been educated without suspecting it, in a perfectly normal manner, or as Fröbel expresses himself in an all-sided unity of life; before thinking of writing a letter she had learned to execute a multitude of things with the most simple playthings, to build beautifully with the cube and its derivatives; to make pretty designs with tablets of different forms and colors; as well as with the little sticks, etc. Lina then was a precocious child, and the age at which she begins to instruct herself cannot be taken for a rule, when the question is of children who have passed months in knitting a garter very badly, and years in making a stocking which a machine does infinitely better in a few minutes. Such children become adults without going out of leading strings. Fröbel attributes, in a great part, the imperfection of our schools and our teaching to our instructing our children without their feeling the want of it, and even after having extinguished that want in them. I will disagree with Barnard in the first part of what he said. Froebel's intent was not to fix the year (6) at which reading should begin, but to describe the natural process through which a child arrived at an age in which their own desire to learn and grow led them to engage in writing and (then) reading. In conventional schooling we trample upon the children's natural inclination to learn and make what they do learn (generally outside the sphere of their interest) more difficult and irrelevant to them. Whereas for Froebel (and at the Clear Spring School) lessons are intended to connect with the interests of the child, not to adhere to some administratively derived targets for learning. Make, fix, create, and instill in others the desire to do likewise. Facebook founder Mark Zuckerberg gave 100 million dollars to the Newark New Jersey school district to reform education. There seems to be no amount of money that would actually do that, since money is generally allocated from the top down. Administrators get their need for self-actualization fulfilled by "assembling teams" and writing policy. On the other hand, artists and craftsmen shape the world in more direct ways, and the direction of American education must not be writ large, but written in the smallest of details, with the empowerment and self-actualization placed in the hands of teachers, students and parents. The Prize, by author Dale Russakoff tells what went wrong with Newark and the ultimate waste of Zuckerberg's gift. When will someone tell the story of how to make things go right? New York Times columnist reviews Russakoff's book here. It is unlikely that educators (having been academically educated) will suddenly awaken to the hands as their greatest educational resource. The pendulum on that continues to swing in the wrong direction despite the rise of the maker movement and STEM education. In the meantime, I've been finishing the last step-by-step photos for Tiny Boxes, and had to re-design my method of shaping the lids for business card boxes. I made a jig for it. Tiner are Norwegian bent wood boxes, and as you can see I'm making several. My wife calls these my "bentwood beauties". Making a card holder box, and the tiny tiner are the last two projects to complete for my Tiny Boxes book, and yesterday I took some of the last step-by-step photos needed for the book. During the next month and a half, I will be finishing the text and taking the beauty shots of each project and its variations. This book has gone more quickly than I expected due in part to the small size of the projects, but also to the amount of fun I've been having in making each one. My shop and finish room are littered with tiny boxes of all kinds, ready to be finished, photographed and sold. - Maria Montessori was right, it is the body that learns. Today, the development of technology helps reduce drastically the engagement of the body in learning. It is assumed that cognitive activities are pure abstraction: it is a serious mistake, one begins to realize. There is an emerging scientific current called "embodied cognition", which calls for a return to the body put into play in learning. That said, Maria Montessori was not the first to defend this view: the mathematician Henri Poincaré, in the nineteenth century, said: math, it passes through the body. It is true that digital technology is smart stuff. Einstein noted that his pencil and he were smarter than he was, and so the purpose of technology has always been to strengthen the hand of man, so to speak, in our understanding and control of the environment. But what favor have we done for our children if we leave them virtually helpless in confronting the real world and real work? And if it is true that we learn first and best through the body, what favors have we granted the intelligence of our kids if we have failed to train their hands to express real skill? It is certainly one thing to have a subject in mind, and another entirely to have it in the heart where it finds purpose, and in the hands where it finds use. A friend of mine says that if you want to be a better woodworker, do more of it. Another friend, David, sent this cartoon from 2002. We all know (I hope) the feelings that come from the development of skill. Even when the starting point has such a low threshold as shown in the cartoon, to identify with those who make useful and beautiful things instills a sense of pride. Woodworking! If you've not done it, do it. If you've done it before, do it again, and plan to do more of it. What the cartoon character fails to mention is that by cutting the board in two, he's made himself whole. I've been making more tiny bentwood boxes as shown below. Make, fix, create and assist others in doing likewise. The interesting point about making beautiful and useful objects is how one leads relentlessly to another which leads to another after that. As one develops a bit of skill, the most natural inclination is to test it against other challenges and opportunities. Writing the tiny box book has required that I apply what I've learned from other projects to a smaller scale which then will be applied down the road to other beautiful and useful objects and other teaching and learning opportunities. This summer I taught two classes in making Scandinavian bent wood boxes, so what you see here is my first prototype of a tiny bentwood box. The woods are elm and crotch figured walnut. I will also offer a shaker variation of this box and one made by boiling veneer stove top (if successful). On the NPR this morning they talked about the origins of the phrase "tooting one's own horn." It appears the origins were that when royalty walked into the room, the trumpets would be blown by loyal minions, not by the royal personage him or her self. For a royal person to blow his or her own horn would have been an embarrassment, not an honor. This box, and so many simple crafted objects like it may not be the cause for fanfare in a culture that has lost touch. But to hold what you have made in your own hands may be trumpet enough. Happy Labor Day. Here in the US, we celebrate labor once a year by taking a 3 day weekend to escape from it all. Our small town is jammed with tourists this weekend, so it is a good time to stay home and make tiny boxes. I've been making boxes to hold business cards, and each assembled unit will be cut apart to become two boxes. I've been adding keys of contrasting wood to strengthen the joints. The boxes will have lids of either maple or walnut, and tomorrow I will start assembling the lids, shaping them with a small router and drilling them for copper hinge pins to fit. John Grossbohlin noted my comments about scouts, soap, and butter knives and sent a link to the boy scout's wikipage on knives and knife safety. "When I taught the Weblos I had them use real knives and showed them how to carve tent stakes. Tent stakes require all the basic knife techniques... parents were unbelievably afraid for their children’s safety during the class. It occurred to me afterwards that from watching the parents they had no idea how to safely use a knife! I found out that many of the parents were still cutting their children’s food at the dinner table when the kids were 8-10 years old!" With new generations arising that have had little or no experience in the use of real world tools, we can expect disproportionate fears of engagement real tools to increase at a rapid rate. Along with that, we can expect the common man to have little or no interest in how things are made, and little or no capacity to make beautiful and useful things. Today in the wood shop, I will continue making business card boxes, and photographing the process. In the meantime, following the same two from one theme, I've learned that making two tiny bentwood boxes at the same time is also a successful formula. It is easier to get a smooth curvature if two are bent at the same time from one long strip. These will be glued and lids and bases will be made. I have begun working on a business card box/holder and exploring design ideas. The concept is simple, and not unlike the cassette cases and CD cases that are thrown away every day. Hopefully these will become too lovely and useful for that. The challenging part is making simple routing templates to shape the lid to provide a tab for opening the lid and front of the box where the lid will fit. The more challenging part will be making it easy for my readers to do the same thing. I carved the prototype by hand using chisels and a sloyd knife. So the question nags. Is it better to make procedures and processes easy so students learn from their success, or leave those things obscure so that students learn from their failures? This box is made from elm and walnut. The finished design will have miter keys at the front corners. As a variation of this design, I'll add commercial inlay strips on both the front and back. The finished boxes will be gently rounded to fit in a pocket. I'll also do do a deeper model to hold a larger number of cards for desktop use. In the school wood shop, I seem to have managed to make a workable bow that my students will have success with, both in the making and in archery. In addition, I've begun work on my 9th and 10th tiny boxes. One will be a miniature bent wood box based in part on one I bought in Estonia. The other will most likely be a business card holder box. The photo above shows my experiment in bending elm to making a tiny oval box. The size of the finished box will be about 1 1/2 in. x 2 in. and about 1 in. high. I cut the elm about 1/16 in. thick and boiled it until soft enough to bend. While I used my boiling tank for shaker boxes to bend this wood, this one is actually small enough to boil in a pan on stove top. In the meantime, researchers at MIT have come up with a direct design to print program that will make it very easy for 3-D printing enthusiasts to customize designs by using a set of sliders. That means there will be even more plastic in the world, and less engagement with the materials that have long shaped human culture. If you have "designed" something through the use of "sliders"will there be satisfaction in it for those who may actually have developed skills and know better? At one time, the boy scouts decided that they would give merit badges for carving soap with a butter knife. The idea was that the soap would be easy and safe. But if all things are to be made easy, how will children develop character, resilience, and strength? If all risks are removed, how will our children develop good judgement and the ability to assess risk? Richard Bazeley sent this photo of his year 7 student's spoons carved from fruitwood. I think you can see that the designs came in part from a study of the materials at hand. Some things become easy because we have developed knowledge and skill. On the other hand, some things are made easy for us, and we pay dearly for those things. There are some things that must be done to make a compound miter saw safe for box making. First of all, they are intended for cutting long strips of molding as a carpenter's tool. That means that a compound miter saw comes out of the box without a zero-clearance backing board or any effective means to clamp small parts. In the normal use of a compound miter saw, it is fairly easy to keep your hands away from the blade, as the stock is usually long enough that holding it securely will require them to be a safe distance away. With small parts, that is not the case. In the photo shown above, cutting miters for a small box, you can see the Baltic birch backing board that I've screwed to the miter saw fence. This gives a great deal more support than the fence that came with the saw. I've also added a stop block and I am using two hold down blocks to keep the stock in place during the cut. I use two hold downs because when the work piece is flipped over to cut the miter on the opposite side, they will apply pressure independently to the irregularly shaped molding. A third tip is to buy a good blade. The one that came with your saw was intended for rougher work. Yogi Berra said that "In theory, there is no difference between theory and practice. In practice there is." Both table saws and compound miter saws can cut miters. But some practice would be required by either to use to best effect. I woke up in the middle of the night thinking about boxes, and so in the wood shop, I made some. Black Elk talked about how one's dreams energize one's life, and that by acting out what we dream, power is drawn into our lives from the universal mind. In my dreams, I had some trouble crystalizing what I was to make, so in real life, I made two designs and invite your comments. The one at the left seems to reflect a classic Chinese design motif. The one to the right more classic modern, and might trace its design origins to Danish furniture craftsmanship. 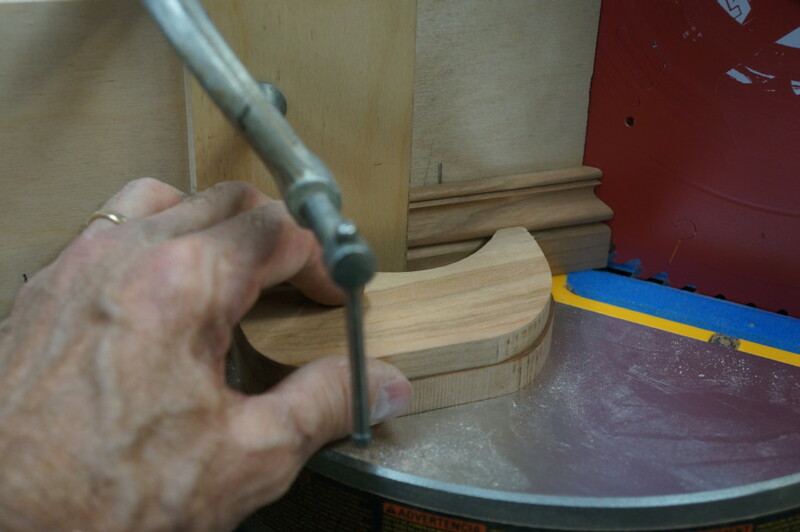 Both use the same router bits, with the initial molding being identical, and their difference comes from the molding being flipped. What's right side up in one is upside down in the other. Ironically, the one at left appears larger than the one at right, even though they are exactly the same size. Time magazine this week named a variety of things that schools could do to make themselves better for kids. One was mandatory recess at all ages. Recess is like dream time, and power is drawn from detachment. How are we to know who we are and what interests us when we are overwhelmed by a constant stream of lessons in which we find little or no relevance to our own lives? The reason I wake up in the night thinking about boxes is that I am passionate about making things from wood. Recess is not just about play. It IS a time in which materials are processed on neutral ground. Some mornings lately, I've been finding it more difficult to write in the blog. Some say I write too much. But I insist that we come to our senses about how children are taught, and what they are to be taught. Those nincompoops who came up with the notion that we would live in an "information age," and have a "service economy" in which all things would be made in China should be called out and embarrassed for their stupidity. The control of American education should be wrested from their unskilled hands. Take sides and join me in revolution. Dream, make, fix, create, and encourage others to do likewise. The upper elementary students at Clear Spring School have been involved in outdoor education during the start of the school year and their particular focus has been on trees over the past week. Next week they will make cutting boards using woods that they have identified on campus, so they will learn something about grain, the working qualities of the woods, and to identify species and their potential uses. In other words, they will have a strong grasp of their environment and their interconnections to it. If we were studying plastics and their uses, and what became of them when we were done with them, it would be a far less engaging stream of study, but it might lead us on a virtual adventure, from manufacturing plants in China to landfills in Oklahoma, and to the gyres of plastic detritus swirling at the centers of the oceans between continents. Those are important studies, but we must first learn to act and learn locally within our personal environments, before we take on the greater issues that trouble the planet. One of the things that excited me as a beginning woodworker was to lay claim to the whole of the creative process, taking wood in its raw form, and crafting it to a finished object. The spirit of sloyd can be found in that. I can remember being given a piece of wood in 7th grade shop class and a sharp plane and being told to square its edges and flatten its face. The same will happen next week with my students. At school I have been experimenting with various ways to make limbs for archery bows. I've laminated some, and have bent some using the boiling tank for making shaker boxes. I have also received brass knobs that I ordered for tiny boxes as shown in the photo above. Make, fix, create... Help others to do likewise.